Boutique gym design specialist zynk has been given the green light to press ahead with its design concepts for FirstLight’s revolutionary new 9000 sq ft cycling studio, which will be located at Westfield’s Phase 2 development, Shepherd’s Bush, London. 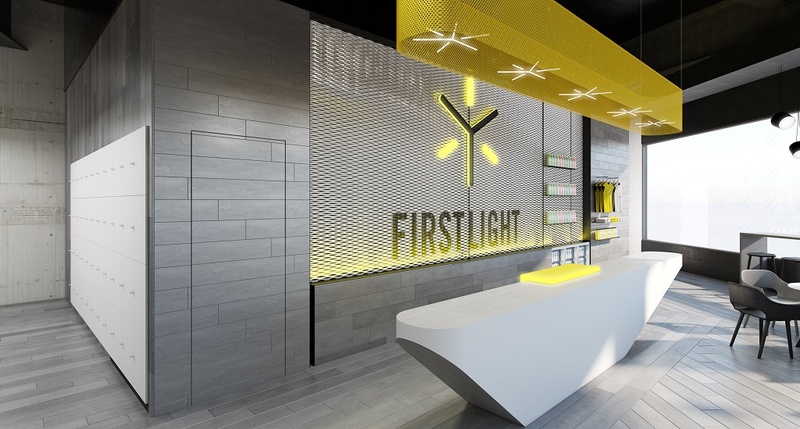 FirstLight is the only cycle experience of its kind in the UK and zynk was briefed to create an interior that delivered a brand personality to match the innovation of the exercise experience, with careful consideration given to the commercial requirements of the business. The pioneering concept behind the FirstLight indoor cycling studios uses sunlight simulation technology to recreate the experience of sunrise and sunset, both of which have been scientifically proven to work in harmony with the natural Circadian rhythms of the body, improving physical, mental and behavioural well-being. Working with the brand’s core concepts and colour scheme, zynk has developed a complimentary colour palette consisting of yellow and storm grey tones, which is offset with a black and white backdrop. Together, these hues successfully translate across a mixture of materials including concrete, timber and mesh, adding a lux overtone to an industrial theme. When the site opens in June 2018, there will be two cycling studios; one large studio hosting 68 bikes and a smaller studio with 33 bikes. A third studio will be opening later in the year, offering a pioneering boxing workout which will be another first for the UK. In addition to the cycling studios, FirstLight members will have access to a relaxing lounge area where they can enjoy a carefully selected range of refreshments, plus adequate changing areas will accommodate the anticipated number of riders. The FirstLight studio is located on the first floor but accessed from the ground floor, so zynk has designed an impressive 20ft entrance which immediately shows the brand’s identity. Members ascend a striking staircase that has been designed with a mesh tunnel, before arriving at the reception area. Work is due to be completed in June 2018, with the third Boxing studio opening later in the year. If you would like to know more about zynk and how it could help your fitness business contact us here.